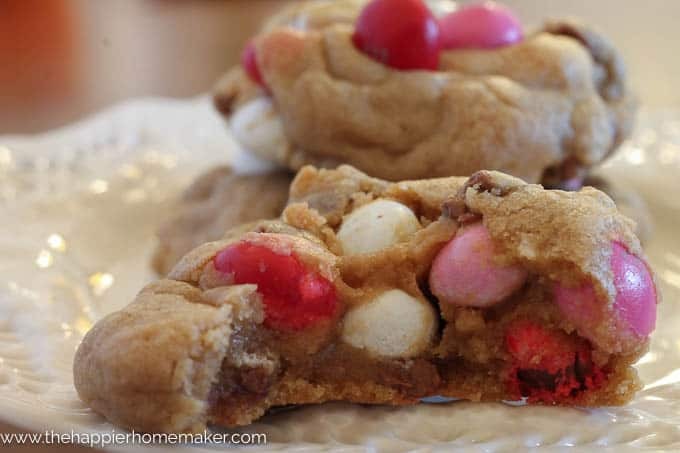 Remember those amazing Soft Batch M&M cookies I shared a couple of weeks ago? Oh man, they were good. Perfectly thick and chewy with the perfect buttery flavor… They were so good that I thought it would be a shame not to share their deliciousness with others so I packaged them up in an easy to make Cookie Mix in a Jar with a free printable recipe card ! I topped my mason jar off with a pretty red canning lid and some red velvet ribbon I had left over from Christmas! 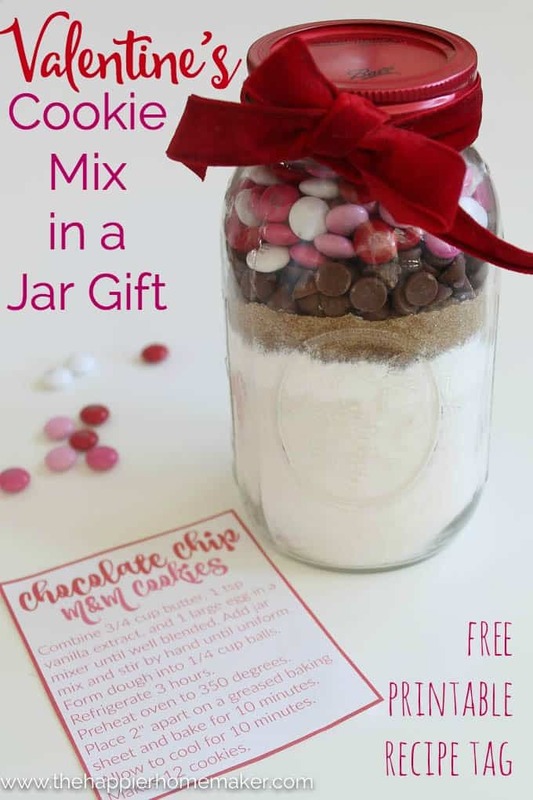 Get your printable recipe pdf to gift with the mix here! Such an easy gift to give, don’t you think? 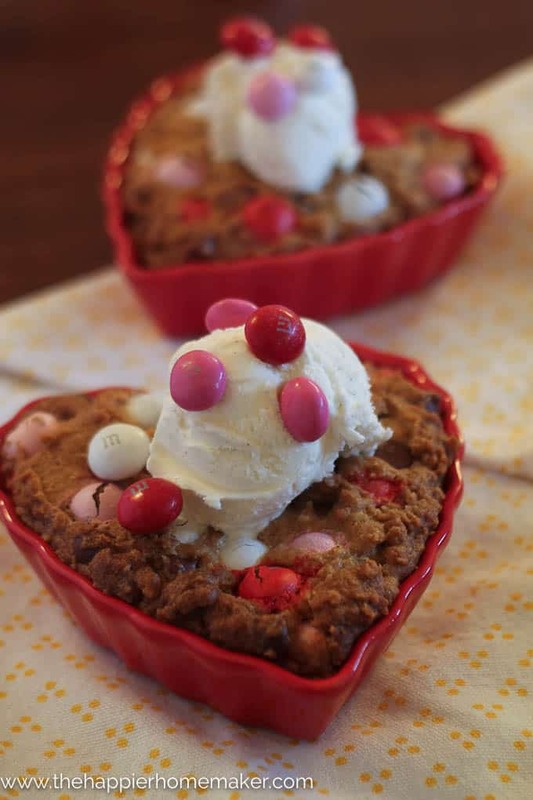 I actually cooked up my second batch of this dough in little heart shaped ramekins for my husband last weekend-they needed to bake a little bit longer but were delicious topped with ice cream! Thanks for this idea…I am going to make one up to give to our new neighbors…. them in the heart shaped ramekins. Hi-beautiful but even when I firmly packed down the brown sugar, there was only room left for the 2/3 cup chocolate chips…no room for M&Ms. I used the 32 oz. (quart sized mason jar, the choc chips filled to the top. Suggestions? I had the same problem Laura had. I cut my chocolate chips down to 1/2 cup and just poured in as many m&Ms that I could. I didn’t measure them. I did everything I could to tap down the flour but nothing worked for me. I am giving these a gifts tomorrow, I hope they taste okay when they make them up.